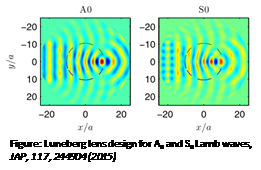 We investigated acoustic metasurfaces consisting of either single pillars or lines of identical pillars on a thin plate, used to scatter incident Lamb waves. Depending on the geometrical parameters, the monopolar (compressional) and dipolar (bending) resonances of the pillars can be excited individually or superposed [Phys Rev B 2016]. We currently work on the demonstration of refractive properties of such structures, with application to the subwavelength focusing of elastic waves. We also presented new designs of pillars for a high confinement of local resonances, in particular the case of hollow pillars for whispering gallery modes [Phys Rev B 2016]. We investigate the case of pillars made by a multilayered material on semi-infinite substrate (see figure) [Phys Rev Applied 2018] and show physical properties as Fano resonances interactions, or acoustic induced transparency for SAW (surface acoustic waves). We studied the properties of mixed phononic crystals and acoustic metamaterials for which at least one of the component is a fluid. The results have been applied to the detection of bio-chemical analytes with high sensitivity. We took benefit of different physical behaviors like band gap shifts, cavity and Fano resonances. 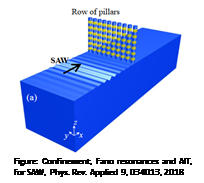 As an example, we investigated theoretically the properties of phononic crystal plates with hollow pillars, used for sensing the acoustic properties of the fluid or their variations with temperature [Crystals 2016]. 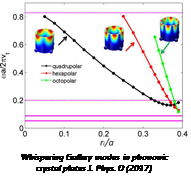 The subwavelength focalization in a current issue in the field of metamaterials. We developed an original method based on an effective medium approach [Sci. Rep. 2016] for the design of gradient index (GRIN) devices for elastic waves in plates. The method allows controlling the simultaneous propagation of three fundamental Lamb modes. It has been applied to the design of Luneburg, Maxwell and flat gradient index lenses. Arrays of metal particles supported on a dielectric/metal film supporting “metal-insulator-metal” surface plasmon modes have been studied for sensing purposes, with bulk index sensitivity among the highest to date [Sci. Rep. 2015] (coll. LNIO, UTT, Troyes). Deformation sensors have also been investigated, based on the interaction of localized plasmons with grazing diffracted waves [JPCC 2017], or local plasmons confined between nanorods on an elastomeric substrate [ACS Appl. Nanomat 2018]. A collaboration has been initiated in 2014 between IEMN and HORIBA FRANCE for designing a new generation of metal plasmonic probes for AFM / Tip Enhanced Raman Spectroscopy (AFM-TERS). The probes have been patented (FR3050033 2017-10-13 BOPI 2017-41), and are fabricated and characterized at IEMN (coll. NAM6 group, IEMN and HORIBA FRANCE, joint ANR project TIPTOP). Optomechanic : phonon/photon and phonon/plasmon interaction. We participate in the H2020 project PHENOMEN, with the goal to engineer more complex on-chip phonon networks utilizing guided mechanical waves to connect optomechanical systems. Our contribution has been to consider the acoustic wave propagation in a corrugated nanobeam structure containing two coupled phononic cavities [Phys Rev B 2017]. The coupling of their localized modes can be used to modulate the frequency and the quality factors of the cavity modes and affect their contributions to transmission. In the frame of the Phenomen project, we also proposed a benchmark system that provides a good predictability of the collective phenomena and controllability of chaotic dynamics at low-power threshold. The proposal system is formed by two optomechanical cavities, one has gain and the other with losses, which are mechanically coupled. 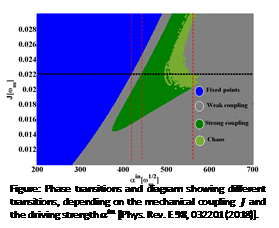 Depending on the driving strength and the mechanical coupling term , phase transitions occur (see figure), and the system switches from weak to strong coupling regimes, leading respectively to phase locking or synchronization, and Rabi or chaotic behavior. We have recently started to investigate the interaction of localized surface plasmon modes with elastic waves in model systems, where the optical properties of bi or tri-dimensional particles are modulated by the moving-interface mechanism. For example : how a metal nanowire interacts with the band gap of a bidimensional grating of holes [AIP Advances 2016]; or, how a three-dimensional system of metal nanocylinders interacts with a metal-insulator-metal plasmon resonance [Phys Rev B 2016]. Due to recent advances in nanofabrication techniques, submicron phononic crystals can reach the hypersonic (GHz) regime and allow for the interaction of light and sound in the same structure. We studied, both theoretically and experimentally using Brillouin Light Scattering (BLS) in collaboration with G. Fytas from Max Planck Institute of Mainz, hypersonic band features in new organic/inorganic periodic stacks. We investigate the propagation of surface acoustic waves parallel and perpendicular to a one-dimensional (1D) phononic crystal constituted by high aspect ratio epoxy nanoridges deposited at the surface of a glass substrate for propagation both parallel and perpendicular to the nanoridges. Filling the nanoridge structure with a viscous liquid produces new modes which propagate along the 1D finite height multilayer array.